It may be the largest of England’s inland counties with a small population but Shropshire has become synonymous with a certain type of rural landscape, perhaps most famously experienced through the poet Housman’s world famous A Shropshire Lad. With it’s historic market towns, links to history from the Roman occupation to the Industrial Revolution – Ironbridge Gorge is a Unesco World Heritage Site – Shropshire is a place of constant surprise. Whether drifting along quiet country lanes, exploring the Shropshire Hills Area of Outstanding Natural Beauty, gazing into the distance from the heights of the Long Mynd, there is something for everyone. With towns like Shrewsbury (birthplace of Charles Darwin), Ludlow, Much Wenlock and Oswestry to explore at the end of a long satisfying drive, Shropshire is an essential part of our touring inventory. Our route will include passing through the old Roman settlement of Bravonium (now known as Leintwardine) through which the old Roman road of Watling Street passes. Our first port of call is the fortified Elizabethan manor house of Stokesay Castle, near Craven Arms. It has it’s own church, St John the Baptist where has been spotted the local church mouse peeking through a small hole in the stone flooring. A free audio guide gives visitors a good sense of what happened in which parts of this beautiful house. The boundaries of the house are formed by the main Manchester to South Wales railway and the A49 trunk road that hugs the Welsh border on the English side of the Marches. 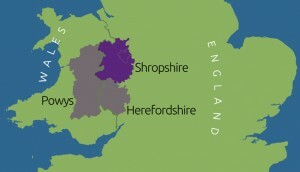 It is the A49 that will lead us to our next points of interest in and near Ludlow. The Ludlow Food Centre at Bromfield near Ludlow Racecourse is a great place for lunch and a browse of local foodstuffs as mentioned in The Daily Telegraph and other UK broadsheets. Following lunch we take a short hop into the historic town of Ludlow, home to the Feather’s Hotel, a magnificent medieval castle and the parish church of St Laurence. It is the base for various festivals such as the Spring Festival that caters for those with a passion for beer and classic cars, the Fringe Festival that includes tours around the town, concerts at St Laurence’s and a Shakespeare play which is presented in the castle – whatever the weather. Ludlow was known as the capital of the Marches and presided over Wales and the local English counties of Shropshire, Herefordshire, Worcestershire and Gloucestershire during the 15th to 17th centuries. The town is also home to many excellent restaurants and is no stranger to Michelin stars. Homeward bound but not before a visit to Shobdon Church and Arches on the edge of the village of the same name. It is hard to put into words the visual impact when first entering this beautiful church. The Arches are sited on the overlooking hill as a folly and originate from the church itself. Our destination for this tour are the Shropshire Hills and their immediate surroundings, an area immortalised by the Worcestershire poet A E Housman in his A Shropshire Lad collection of poems. Shropshire (also known as Salop) has the famous town of Shrewsbury as it’s administrative centre and is the birth place of Charles Darwin. Other famous Salopians include writers Mary Webb and Ellis Peters, Robert Clive (of India) and Thomas Telford after whom a town is now named which sits on the edge of what is claimed to be the birthplace of the Industrial Revolution. From there we meander through the narrow roads to Craven Arms, one of the gateway towns to the Marches, and continue on to Church Stretton – the only town in Shropshire Hills Area of Outstanding Natural Beauty. Lunch and a short walk is recommended for those interested. Our next stage takes us over the narrow road on to the moorland plateau of the Long Mynd, home to wildlife, grassland and the Midland Gliding Club. The views reach east toward the Wrekin and the Malvern Hills or west in to Wales with the Cambrian Mountains in the far distance. Climbing up and down the road hugs the edge of the hill so those who are slightly nervous of drops would do well to enjoy a view to the south, even if it’s only a grassy bank! We hop from one of the high points to the second highest point in Shropshire; the rocky outcrop of the Stiperstones around which lie myths and legends from another time. The rocky outcrop is known as the Devil’s Chair from where you can survey the hills towards Welshpool and other parts of Powys with the lower Salopian lands in between. This is worth a short or a long walk and you can listen out for birds of prey and carrion birds such as the largest of them all, the magnificent Raven. With lunch as a distant memory our next journey, which starts us south back toward Knighton, takes us into the market town of Bishop’s Castle. This small town on a significant hill houses two breweries. The Six Bells and the Three Tuns (the oldest licensed brewery in the country). It is also home to two museums and an array of small shops; even secondhand music in the shape of CDs and vinyl albums can be found at Yarborough House which is good for a cuppa and a wee cake. The renovated town hall dominates the top of the town with the church of St John the Baptist at the bottom close to the Six Bells. Next, we enter Clun, after which a breed of sheep is named. The River Clun is crossed by a 14th century bridge and in the town stands the remains of the castle, a fine example of a motte and bailey which gives beautiful views of the area. It’s well worth a clamber about but best done in dry conditions.